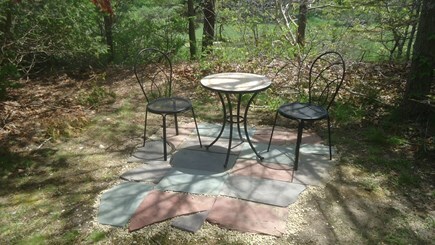 Special $200 off each week starting June 22 and July 6. 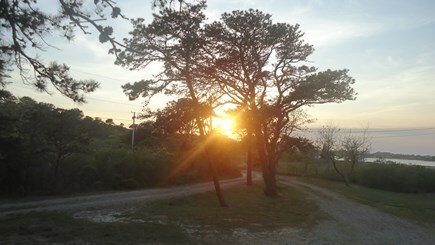 Get your mind off of the snow, rain, and wind and think summer on Cape Cod. I know, it is hard to do. 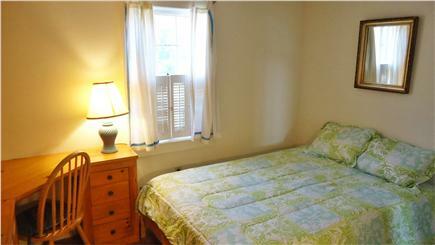 Last week in June open at off season rates not affected by recent legislation. Second week in July open, too, if you want a prime time summer week. 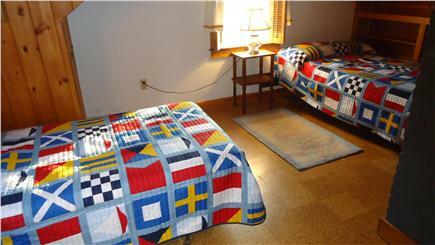 70% repeat guests in 2018. Join the families. This classic, secluded, waterfront home is located down a private road in prestigious North Chatham, overlooking Pleasant Bay and a surrounding inter-tidal salt marsh. 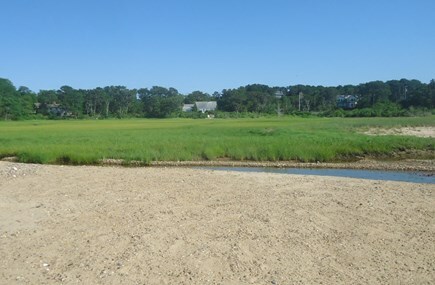 Short walk to a private, sandy beach on Pleasant Bay; shorter walk through the lawn to an additional private beach overlooking the marsh. Check the tides while viewing Strong Island and North Beach. Warmer water for swimming than Atlantic beaches. 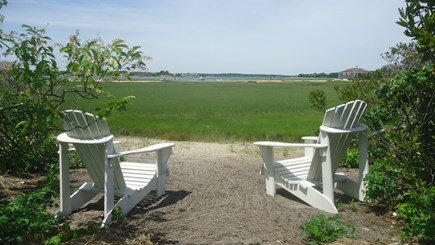 Watch the birds, ducks, egrets, herons and geese over the salt marsh from the patio or the occasional deer and fox from the picture windows. 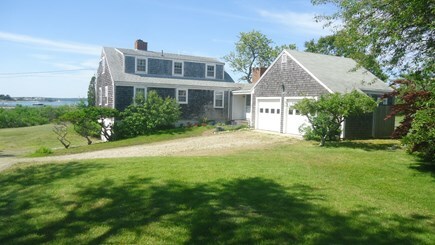 Classic Cape Codder: The house is a two story classic Cape Codder, with a family room and garage addition serving as a recreation room, on 3/4 acre of land, mostly lawn. 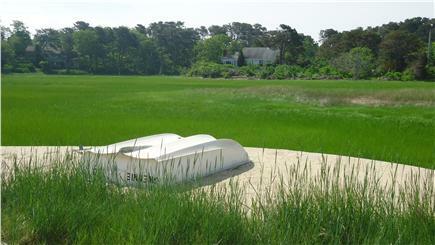 This house sits on a private, secluded, lovely, unique location, 100 yards from a private beach, as an egret flies, accessible by private road, only. 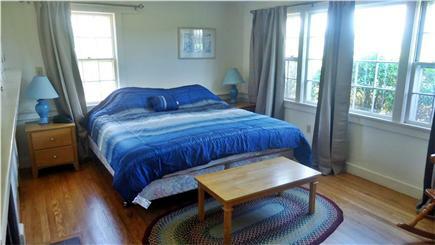 The house, encompassed by the large yard, has easy parking for up to 5-6 cars. The home sleeps and accommodates 10: 1 king, 1 queen, 1 full, 4 twins, 2 full bathrooms, 2 half bathrooms, new outdoor shower out back plus small shower head useful for sandy feet. 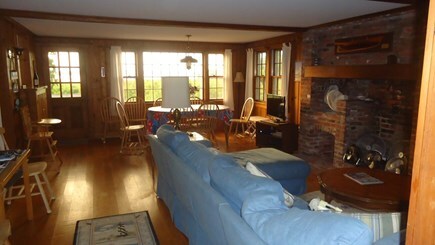 Family room and den. 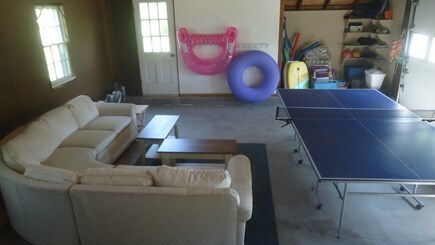 Recreation room with ping pong table. Washer/Dryer. Air conditioning. Wireless internet, or wired, for that matter. 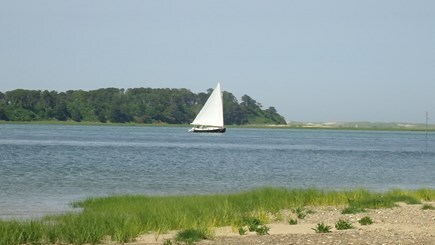 On the north and east is a picturesque New England inter-tidal salt marsh, west and south, trees, in full regalia by June. 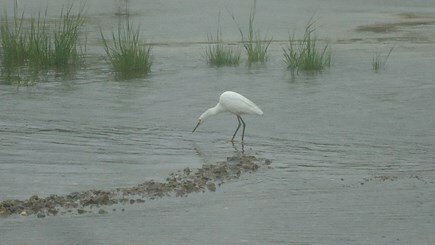 Occasional deer and fox traipse past; waterfowl, egrets, herons, geese, ducks, and a myriad of birds are usual visitors. Two separate, private, moorings are provided for your motor and sail boats, one for up to 16 feet, and a new larger mooring for up to 24 feet - local permits required, which I can facilitate. Bring your kayak. Close to scenic bike trail and route, too. We do not allow pets or smoking. Linens not included. No fires allowed in fireplaces or on beach. Minimum age for leasing - 21 years old. No weddings, apologies. 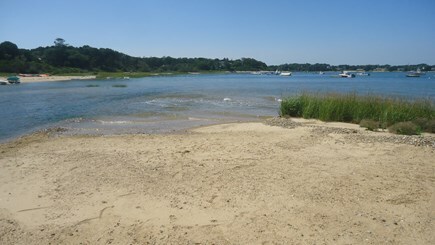 The Private Beach: The sandy beach, on Pleasant Bay, is noticeable in many of the pictures here. 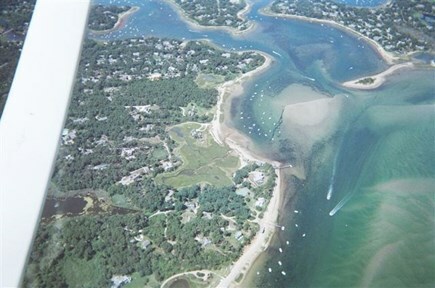 Pleasant Bay, as you know, is well known in North Chatham and Orleans, and the Cape at large, as well as regionally. 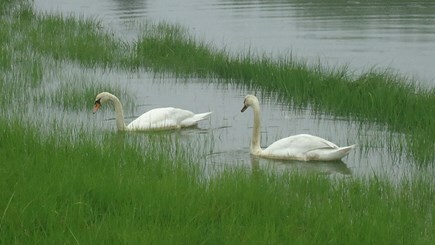 The water is shallow even at high tide, and perfect for children, who would be looking for shells and splashing around. One foot deep at 20 feet out, two feet deep at 30 feet out, etc. Deeper further out for teenagers and adults. 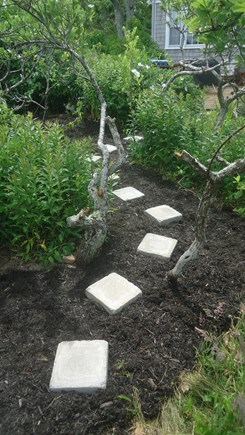 There are some sections with small rocks, shells, and crustaceans at lower tides, accommodating children’s curiosity. Many guests go home with a sampling of these treasures. If you have children or teenagers and don’t really appreciate the crowds at the town beaches, then this is perfect for you. You can watch the boats come and go, or bring your own. 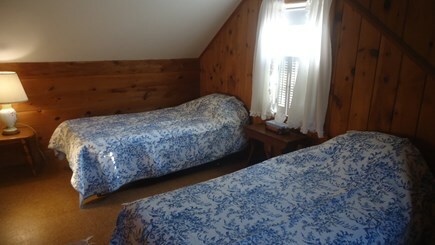 The Accommodations: Accommodations are for ten, in five bedrooms: one king in the master bedroom downstairs, one queen in the guest bedroom downstairs, one full in the den downstairs, with two twins in each of two rooms upstairs, convenient for kids or teenagers. Full bath adjacent to the king and queen rooms, full bath upstairs. Linens not included. 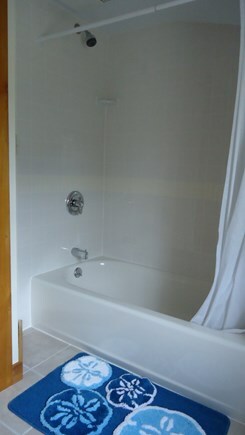 The full bath upstairs includes tub and shower for our new and returning guests. 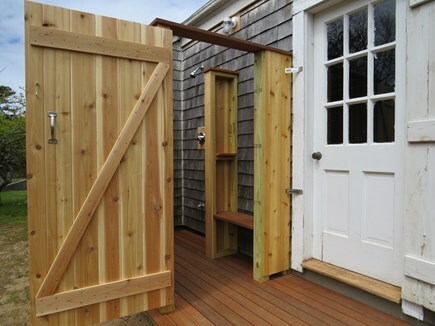 New outdoor shower. Half bath off foyer/laundry room area, new washing machine and adjacent additional shower. Small showerhead for après beach (don’t need to drag the beach sand in). Ping pong table for family fun. Thank you so much for your email. We had a wonderful week. The kids loved staying in the beach house, hope everything was left in good condition! Please can we book the same week next year? Thank you , we had a lovely time and great weather. John, Just wanted you to know we enjoyed your home this week. We have decided to leave on Friday to beat all the 4th of July traffic as we hit it all the way back to our home. Loved the view....the ping pong table was a huge hit with our grandchildren as they have never played. It just worked out great. All was well.....thanks so much. We had 10 adults (in and out throughout the week) and 1 little guy (3 yrs). We were all comfortable, and even on the couple nights where we were all there together we weren't tripping over each other. The upstairs was kind of hot midday, but by evening opening windows provided a quick cooldown. Small kids should probably be kept downstairs for sleeping because of the steep stairs and heat during nap time. Bring a baby gate if you have a little one that won't follow the rules. The outside shower was awesome! The pressure is perfect, and it was the most refreshing shower I have ever had. The shower in the garage is perfect for getting sand off your feet. The beach was absolutely perfect for little ones. The tidal pools have little pockets of minnows and a little chicken on a string will lure tons of tiny crabs at low tide, which proved super exciting for our little man. We saw some seals while kayacking in the bay. We had a fantastic week ! Great location, near everything we wanted to do. Weather was perfect the whole week ! Weather here glorious! Cool and sunny. Have been enjoying the beach and water. And the additions to the house! AC and outdoor shower are wonderful though we haven’t needed the AC after the first day. We had a fantastic time at the house this year! Great granddad came down here to fish and clam late 1800's and decided to stay. That started it with the family, who went on to acquire a house or two and a plot of land or two, and enjoy summers, then, eventually, year round. 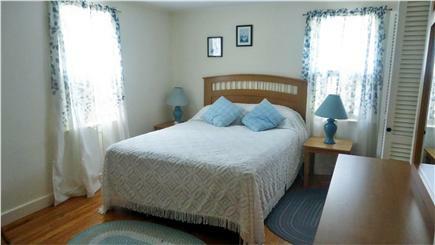 I enjoyed summers here, in this house, while very young, and then eventually lived here year round while growing up. The experiences I had during these years were memorable and unique, next to Pleasant Bay and the Atlantic, sailing and boating, swimming and surfing, fishing and shellfishing, walking the sands of many beaches, watching the wildlife come and go. Enough said. Needs to be shared for your own memorable experiences, and those of your children.. Surrounded on three sides by water.